I promise you this is the video of the day. 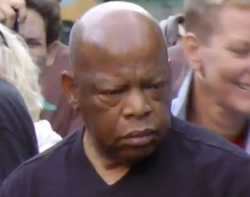 Watch "Occupy Atlanta" (if you can get all the way through it) silence civil rights icon John Lewis from speaking in one of the most aggravating displays of mob "democracy." I’m tempted to parody the left when they cry racism in every Tea Party rally, but I won’t. The crowd is white and it does block Lewis from speaking. But calling the motivation racism gives far too much credit to this hippy-dippy crowd. I don’t think these guys know what they want. And can you imagine what the world would be like if guys like the folks in this video ran the country? They make the Tea Party rally in Searchlight look like First Continental Congress.